Download Fiscal Fact No. 327: Romney, Obama, & Simpson-Bowles: How Do the Tax Reform Plans Stack Up? The comparison offends many people, including Erskine Bowles, Austan Goolsbee, Howard Gleckman, and Bruce Bartlett. What is it about the Simpson-Bowles plan that has us still referring to it two years after it came out? How do the tax plans of Romney and Obama compare to this standard? Do any of these plans have a chance of reforming the tax code, reducing the deficit, or growing the economy? The National Commission on Fiscal Responsibility and Reform, co-chaired by Alan Simpson and Erskine Bowles, was established by President Obama in 2010 as a bipartisan effort to rein in the national debt. The final report, issued in December 2010, contained many bold ideas, but because 7 of the 18 appointees voted against it, including 4 Democrats and 3 Republicans, the report was never sent to Congress for a vote. Since then, the publicly held federal debt has increased from 62 percent of GDP to 73 percent—the highest level since 1950. While many economists believe this level of debt is already a drag on the economy, the Congressional Budget Office (CBO) projects that publicly held debt will go steadily higher over the next decade, reaching 90 percent of GDP if current policy continues. According to the Commission’s estimates, the Simpson-Bowles plan would have brought publicly held debt back to about 62 percent of GDP within 10 years and to 40 percent by 2037. It would cap both spending and revenue at about 21 percent of GDP—somewhat above the long run average. Revenues now are about 16 percent of GDP, so this would be a big tax increase. However, in many respects the Simpson-Bowles plan would raise taxes the right way: by lowering top marginal tax rates dramatically and paying for it by eliminating credits, deductions, and other tax expenditures. It is a menu: one option would lower the top rate on personal income to 23 percent and eliminate all tax expenditures; another option would lower the top rate to 28 percent and preserve the child credit, earned income tax credit, mortgage interest deduction, and health and retirement benefits. Table 1 lists the basic parameters. This approach of lowering tax rates and broadening the base is what is commonly thought of as fundamental tax reform and it was last accomplished through the Tax Reform Act of 1986. However, then as now, it matters greatly how the base is defined. Both the 1986 Reform and Simpson-Bowles defined it too broadly, including all wage and investment income. As a result, Simpson-Bowles would bring the tax rate on capital gains and dividends up to the ordinary rate of either 23 or 28 percent versus the current 15 percent. Not only would this crush investment and any resulting economic growth, it would exacerbate the problem of double taxation, whereby wages are taxed once, then again by the corporate tax if invested in corporate equities, then again by taxes on capital gains and dividends, and then one last time by the inheritance tax. In response, taxpayers would direct even more resources than they currently do to relatively unproductive sectors, like tax planning and consumption, rather than saving and investment. Stephen Entin has modeled the effects of raising the tax rate on capital gains and dividends to 20 percent. He finds it would reduce GDP by 1.19 percent and as a result raise almost no additional tax revenue. Raising these rates further to 23.8 percent would reduce GDP by 2.1 percent and actually reduce tax revenue. Entin finds that Simpson-Bowles in its entirety, with a top rate of 28 percent and other provisions, including longer depreciation schedules, would reduce GDP by almost 3 percent and raise almost no additional revenue. The history of capital gains taxation corroborates this story. 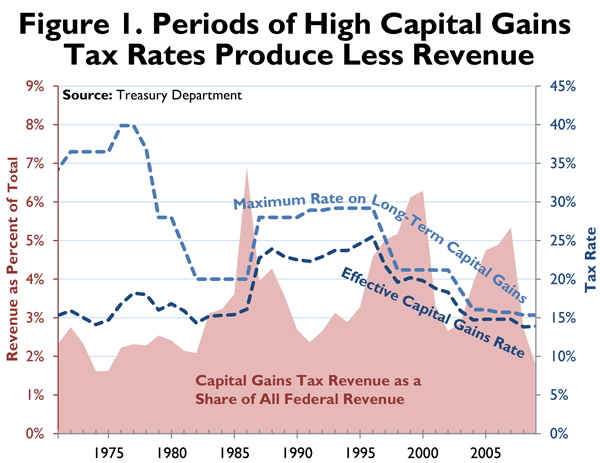 As Figure 1 shows, based on Treasury data, periods of high capital gains tax rates produce less tax revenue, not more. When the capital gains rate was 28 or 29 percent between 1987 and 1996, capital gains tax revenue averaged 3.33 percent of total federal tax revenue. Since that time, while the rate came down to 20 percent in 1997 and then 15 percent in 2003, capital gains tax revenue has increased to an average of 4.21 percent of federal revenue. This is partly because capital gains income is relatively easy to shield from taxes, either by holding on to the asset until tax rates come down or by passing it on to heirs. A higher dividends tax in conjunction with a higher capital gains tax has a better chance of raising revenue, but this too would likely disappoint since capital is free to flow across borders, to places like China and India where there is no tax on capital gains. Tax revenue from capital gains has always been small, and from dividends even smaller. Instead of raising more revenue, higher tax rates would merely lead to more wasteful tax planning, more inefficient allocations of capital, and less economic growth. Real tax reform would reduce or eliminate the double taxation of investment and the tax-favored treatment of consumption over saving. How do the Tax Plans of Romney and Obama Stack Up? Romney’s plan is laudable in that it aims for a Simpson-Bowles style reform, with lower rates and fewer tax expenditures but without the Simpson-Bowles additional penalties on saving and investing. The top rate on personal income would be 28 percent, matching Simpson-Bowles, and the bottom rate would be 8 percent, making the rate structure more progressive than under Simpson-Bowles. On tax expenditures and simplification of the tax code, Romney has been less specific, as noted by us and many others. Romney apparently intends to preserve certain tax breaks for the middle-class, including the charitable giving deduction, mortgage interest deduction, and health and retirement benefits, leaving the rest to be negotiated with Congress. This is less than ideal. However, if all other tax expenditures were eliminated, this would be similar to the Simpson-Bowles plan with a 28 percent top rate (see Table 1). Critics doubt Romney can make these hard choices, but the GOP is signaling a newfound willingness to reduce or eliminate such sacred cows as the mortgage interest deduction and ethanol credits. Romney’s critics object most ardently to his plan to maintain or reduce further the tax rates on capital gains and dividends. The plan calls for maintaining the current 15 percent tax rate for those earning more than $200,000 and eliminating taxes on all investment income including interest for those earning less than $200,000. This addresses a major weakness of Simpson-Bowles, as demonstrated in the previous section, although it is still far from the ideal of no double taxation of investment. Romney’s critics claim it makes his plan a revenue loser relative to Simpson-Bowles, but there is no evidence that a higher rate would raise more revenue. Romney’s critics also claim that the benefits would mainly accrue to high income earners, but this too has little empirical basis. It is true that maintaining the current low rate on capital gains, in particular, is most immediately beneficial to high income earners, but the benefits ultimately are shared broadly in the form of greater investment leading to more economic growth and more jobs. Indeed, income inequality today is about the same as it was under the high tax rates of the Clinton era, according to the Congressional Budget Office. Romney’s critics fail to properly take into account these broadly beneficial growth effects. Nor do Romney’s critics properly acknowledge the benefits of Romney’s plan to eliminate the estate tax. Austan Goolsbee, for instance, claims it is a $1 trillion giveaway to the rich. However, according to the Bureau of Economic Analysis, the federal estate tax has never raised more than $29 billion per year, or about 1 percent of total federal revenue. This is less than the estimated cost of complying with the estate tax. The main effects of the estate tax are misallocated capital, wasted resources on tax planning, and the liquidation of thousands of family businesses. Goolsbee argues that Obama’s plan is closer to the spirit of Simpson-Bowles but it actually bears little resemblance even to this imperfect standard (see Table 1). Obama has steadfastly called for both higher rates and a multitude of new carve outs and tax preferences, however, mixed with limitations on those tax benefits for high-income earners. The overall effect is more complexity. Under Obama, tax rates on personal income, capital gains, and dividends would all be dramatically higher than under Simpson-Bowles or Romney. On corporate taxes, the administration has agreed to a lower rate but remains steadfastly opposed to the Simpson-Bowles recommendation to move to a territorial system that exempts foreign earnings, which is the international norm. Yet this same framework calls for specifically eliminating only 6 tax expenditures out of some 250 identified by the Joint Committee on Taxation. Worse, it adds 11 more for a net gain of 5 tax expenditures. Finally, Obama’s plan critically fails to reduce the debt or increase long-term economic growth. The CBO finds Obama’s budget would result in higher deficits and more debt than would Simpson-Bowles due mainly to unconstrained spending on healthcare entitlements. Obama never balances the budget, whereas both Simpson-Bowles and Romney eventually do, albeit slowly. As a result of such high debt loads and high tax rates, the CBO projects that Obama’s budget would produce extremely slow economic growth over the long run—on the order of 1 percent per year. In contrast, Romney estimates that his plan would grow the economy 4 percent per year. Politics is the art of the possible and Simpson-Bowles shows us what was almost possible in 2010. On the plus side, Simpson-Bowles shows us how significant revenue can be raised by lowering tax rates and eliminating tax expenditures. However, its major failing is that it raises taxes on investment, which would raise no additional revenue and only exacerbate the current anti-saving, anti-investing bias in the tax code. Real tax reform would produce a tax code that is simple and treats all taxpayers equally. It would also treat all consumption equally, whether that consumption occurs now or, as a result of saving, later. This would best be accomplished by lowering tax rates on saving and investment to match the current zero tax rate on consumption. Obama’s tax plan is largely at odds with any commonly held notion of tax reform, including Simpson-Bowles. It would result in dramatically higher tax rates, on the order of 50 to 90 percent higher than the Simpson-Bowles tax rates on personal income and investment income. Tax rates on investment income would return to levels not seen since the early 1980s, i.e., prior to the 1986 tax reform on which Simpson-Bowles was modeled. The half of the population that pays income taxes will not swallow the medicine of tax reform without the sugar of lower tax rates, and President Obama has foreclosed on this option. While the president has voiced support for eliminating tax expenditures, his specific proposals tend to add more than are taken away, although he has proposed limiting them for high-income earners. Not only does this fail to simplify the tax code, it fails to spur the economy, ultimately resulting in insufficient tax revenue and perpetual deficits. In contrast, Romney’s tax plan takes concrete steps in the direction of Simpson-Bowles, while not excessively taxing saving and investment. It lowers the top rate on personal income to match that of Simpson-Bowles and promises to reduce tax expenditures, although it appears Romney is not willing to expose the middle class, and perhaps other groups, to a full scrubbing of the tax code. It will take more specificity, leadership, and compromise to eliminate long-standing preferences like the mortgage interest deduction, but Romney is on the right track in lowering tax rates. On investment income, the plan maintains current tax rates for high-income earners but eliminates taxes for everyone else. The plan also follows the Simpson-Bowles advice to lower the corporate rate and move to a territorial system. Overall, Romney’s tax plan makes important reforms that are likely to lead to lower deficits, an eventual balanced budget, and more economic growth. William McBride, Stuck in Neutral on Tax Reform, Tax Foundation Tax Policy Blog, Aug. 20, 2012, https://taxfoundation.org/blog/stuck-neutral-tax-reform. National Commission on Fiscal Responsibility and Reform, Co-Chairs’ Proposal, Nov. 10, 2010, http://www.fiscalcommission.gov/sites/fiscalcommission.gov/files/documents/CoChair_Draft.pdf. Mitt Romney: Rich Taxpayers will Pay Their Share, Fortune, Aug. 15, 2012, http://finance.fortune.cnn.com/2012/08/15/mitt-romney-interview/. Erskine Bowles, Romney’s Tax Plan Wouldn’t Cut the Deficit, Washington Post, Aug. 9, 2012, http://www.washingtonpost.com/opinions/why-romneys-tax-plan-wont-cut-the-deficit/2012/08/09/37fb2d20-e19c-11e1-a25e-15067bb31849_print.html. Austan Goolsbee, Mitt Romney’s Tax Plan and the Middle Class, Wall Street Journal, Aug. 21, 2012, http://online.wsj.com/article/SB10000872396390443324404577595440116857330.html?mod=googlenews_wsj. Howard Gleckman, The Bowles-Simpson and Romney Tax Plans Have Almost Nothing in Common, Tax Policy Center Blog, Aug. 9, 2012, http://taxvox.taxpolicycenter.org/2012/08/09/the-bowles-simpson-and-romney-tax-plans-have-almost-nothing-in-common/. Bruce Bartlett, GOP: All Talk on Eliminating Tax Breaks – No Action, Fiscal Times, Aug. 24, 2012, http://www.thefiscaltimes.com/Columns/2012/08/24/GOP-All-Talk-on-Eliminating-Tax-Breaks-No-Action.aspx#page1. William McBride, How to Judge a Tax Plan, Tax Foundation Fiscal Fact No. 286 (Dec. 15, 2011), https://taxfoundation.org/article/how-judge-tax-plan. This is just the publicly held portion of the national debt. Including the portion of the debt held by government agencies, the total gross debt now exceeds 103 percent of GDP. For the latest budget projections, see Congressional Budget Office, An Update to the Budget and Economic Outlook: Fiscal years 2012 to 2022, Aug. 22, 2012, http://cbo.gov/publication/43539. Carmen Reinhart, Vincent Reinhart, & Kenneth Rogoff, Debt Overhangs: Past and Present, NBER Working Paper No. 18015, Apr. 2012, http://www.nber.org/papers/w18015. See also James Bullard, European Sovereign Debt Crisis: A Wake-up Call for the U.S., Central Banker, Summer 2012, http://www.stlouisfed.org/publications/cb/articles/?id=2263. The Bipartisan Policy Center figures Simpson-Bowles would bring public debt down to 67 percent of GDP by 2022. See David Brooks, Ryan’s Biggest Mistake, New York Times, Aug. 23, 2012, http://www.nytimes.com/2012/08/24/opinion/brooks-ryans-biggest-mistake.html?_r=0. William McBride, The Budget Debate in Pictures: A Look at CBO Projections and the Role that Bush-Era Tax and Spending Policies Play in the Deficit, Tax Foundation Fiscal Fact No. 273 (June 14, 2011), https://taxfoundation.org/article/budget-debate-pictures-look-cbo-projections-and-role-bush-era-tax-and-spending-policies-play-deficit. William McBride, Would Romney Pay Zero Taxes under the Ryan Plan?, Tax Foundation Tax Policy Blog, Aug. 13, 2012, https://taxfoundation.org/blog/would-romney-pay-zero-taxes-under-ryan-plan. Testimony of Stephen J. Entin, President and Executive Director, Institute for Research on the Economics of Taxation, before the Senate Committee on Finance, hearing on Tax Reform Options, Sept. 14, 2011, http://www.finance.senate.gov/imo/media/doc/Entin%20Testimony.pdf. Stephen Entin, Institute for Research on the Economics of Taxation, Fiscal Commission Report Falls Short, Dec. 23, 2010, http://iret.org/pub/ADVS-272.PDF. Tax Foundation, Federal Capital Gains Tax Collections, 1954-2009, https://taxfoundation.org/article/federal-capital-gains-tax-collections-1954-2009. Economists generally find that capital gains realizations are quite sensitive to taxes, with elasticity estimates usually around -1, indicating a 10 percent increase in the capital gains tax rate results in a 10 percent decrease in capital gains realizations. That means raising the rate would raise no additional revenue. See Tim Dowd, Robert McClelland, & Antiphat Muthitacharoen, New Evidence on the Tax Elasticity of Capital Gains, Joint Working Paper of the Staff of the Joint Committee on Taxation and the Congressional Budget Office, June 2012, http://www.cbo.gov/sites/default/files/cbofiles/attachments/43334-TaxElasticityCapGains.pdf. Robert Carroll & Gerald Prante, Corporate Dividend and Capital Gains Taxation: A comparison of the United States to other developed nations, Ernst & Young, Feb. 2012, http://www.theasi.org/assets/EY_ASI_Dividend_and_Capital_Gains_International_Comparison_Report_2012-02-03.pdf. There are currently no federal taxes on consumption, such as through a broad based sales tax or a value added tax. There are federal excise taxes on a limited number of consumed goods, such as gas and tires. Most states have a sales tax, generally at rates of less than 10 percent, but because there are a number of states without sales taxes, as well as tax-free internet sales, a significant number of taxpayers can avoid sales taxes entirely. In any case, taxes on sales nowhere approach taxes on investment. Mitt Romney for President, Tax, http://www.mittromney.com/issues/tax. William McBride, Romney’s New Tax Plan a Significant Improvement, Tax Foundation Tax Policy Blog, Feb. 24, 2012, https://taxfoundation.org/blog/romneys-new-tax-plan-significant-improvement. Tax Reform Skirmish, Wall Street Journal, Aug. 21, 2012, http://online.wsj.com/article/SB10000872396390443855804577603640127069620.html?mod=googlenews_wsj. Lori Montgomery, Coburn Prompts Senate Vote on Ethanol Subsidies, Washington Post, June 10, 2011, http://www.washingtonpost.com/business/economy/coburn-prompts-senate-vote-on-ethanol-subsidies/2011/06/10/AGXMmqOH_story.html. William McBride, TPC’s Analysis of Romney’s Plan Misses the Point, Tax Foundation Tax Policy Blog, Aug. 1, 2012, https://taxfoundation.org/blog/tpcs-analysis-romneys-plan-misses-point. William McBride, American Jobs Act is about 154 Pages Too Long, Tax Foundation Tax Policy Blog, Sept. 15, 2012, https://taxfoundation.org/blog/american-jobs-act-about-154-pages-too-long. Philip Dittmer, A Global Perspective on Territorial Taxation, Tax Foundation Special Report No. 202 (Aug. 10, 2012), https://taxfoundation.org/article/global-perspective-territorial-taxation. Scott Hodge, More Thoughts on Obama’s Corporate Tax Plan, Tax Foundation Tax Policy Blog, Feb. 23, 2012, https://taxfoundation.org/blog/more-thoughts-obamas-corporate-tax-plan. The White House and the Department of the Treasury, The President’s Framework for Business Tax Reform, Feb. 2012, http://www.treasury.gov/resource-center/tax-policy/Documents/The-Presidents-Framework-for-Business-Tax-Reform-02-22-2012.pdf. William McBride, The President’s Corporate Tax Reform Plan: Rhetoric and Reality, Tax Foundation Tax Policy Blog, Feb. 22, 2012, https://taxfoundation.org/blog/presidents-corporate-tax-reform-plan-rhetoric-and-reality. Congressional Budget Office, An Analysis of the President’s 2013 Budget, Mar. 16, 2012, http://www.cbo.gov/publication/43083. William McBride, CBO: President’s Budget Worse than Taxmageddon, Tax Foundation Tax Policy Blog, Apr. 26, 2012, https://taxfoundation.org/blog/cbo-presidents-budget-worse-taxmageddon.